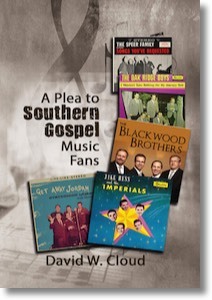 This book is a plea for Southern Gospel music fans to wake up and tear down the bridges that are being built from conservative Southern Gospel-loving homes and churches to the world itself and to the one-world church represented by contemporary Southern Gospel and CCM. It is a plea to wake up to incremental steps that are bringing God’s people ever closer to the world, the flesh, and the devil. I know by long and sad experience that many Southern Gospel fans do not listen to biblical warnings and reproofs. They treat biblical reprovers as carnal critics and refuse to give serious attention to the warnings. I am publishing this warning for those who are true disciples of Jesus Christ and who therefore “continue in” His Word (John 8:31-32). They love Christ and His Word above the closest friendships and relationships (Luke 14:26), certainly above music! True disciples of Christ esteem all of God’s precepts concerning all things to be right, and they hate EVERY false way (Psalm 119:128). They “prove ALL things” by God’s infallible Word. They have a testing mindset. Here is a challenge.. Do you have a testing mindset? Will you put Southern Gospel Music to the test? This ebook has links to over 70 video clips. Make sure the device and app that you use to read the book can link well to a web browser. For example, the linked video's won't work on a standard Kindle device. This book should be read on a computer or tablet that has a good web browser. We have a companion web page that contains links to the video clips. Optionally, you can read the book on your Kindle (or other device) and view the video clips on your computer as you read.